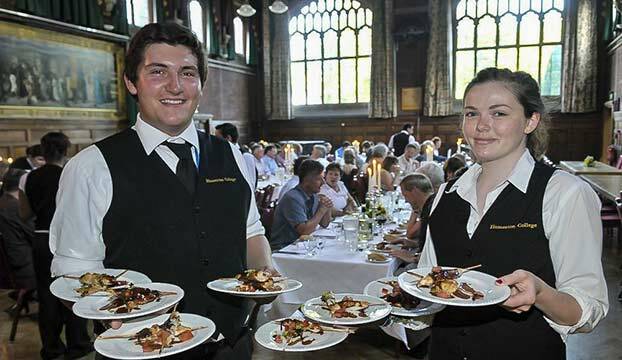 A unique backstage pass providing the opportunity to stay in a historic Cambridge college during your visit to this heritage-rich city, whilst helping to generate revenue contributing to the upkeep of these iconic buildings. 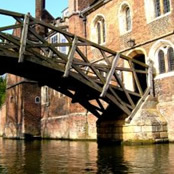 Re-trace the footsteps of graduates such as Newton, Darwin, Wordsworth, John Cleese, and Prince Charles; eat in the college hall, wander through the college's gardens or take a punt along the river followed by a drink in the college bar. 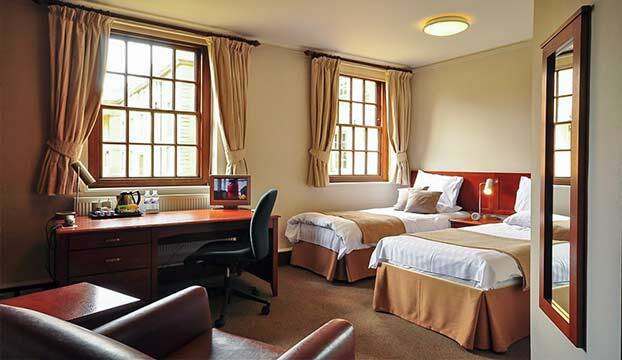 A great alternative to staying in budget Cambridge hotels, hostels or bed and breakfasts. I started out looking for UK campus boarding experience and had my expectation fulfilled with one full of history and tradition. The accommodation whether for tourists (who know what they asking for) or students is beyond value for money. Location excellently close to everything and yet the college is well sound-proved from the busy streets. I love big spaces, big windows, high ceiling of Churchill College, Cambridge building which was designed to well harmonize with nature, sunlight, flowers, etc...Room size is big with big windows. This college serves the guests amazing breakfast for us in the special designed big dinning room. All staffs in this college are friendly, kind and helpful for us. There are many beautiful natural places to enjoy taking a walk, less than 15 minutes walk to town centre. Highly recommendation. Thank you very much. 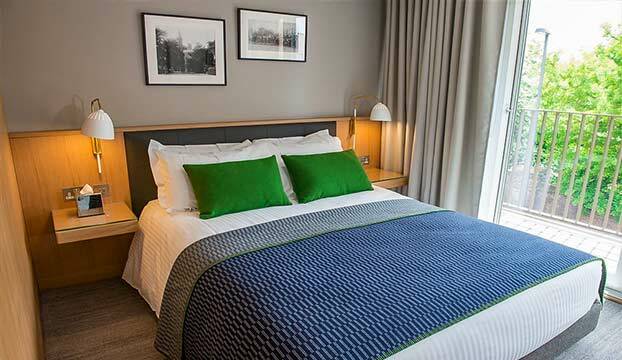 The room/en-suite were extremely clean with a comfortable bed, good quality linen and nice additional touches such as the nice toiletries and dressing gown/slippers etc. The college is very central and it was a bonus to be able to leave our car free of additional cost within the grounds and walk around the city centre. The breakfast was excellent with plenty of choice. We didn't use it, but we also had the use of a kitchen had we wanted it. With Cambridge, the word unique takes on a new meaning. Founded as a University in 1209, the city today has preserved much of its outstanding beauty and original character as a quiet place of thought. Visit Cambridge to wander among its narrow medieval streets or “The Backs”, the outstanding series of college gardens and grounds that lead down to the river. Study architecture of every period and of almost every century, and inspect the University’s many important literary, artistic, and scientific treasures. Some ideas include ghost walks, MP3 guided walks, visiting the Fitzwilliam Museum and of course, no visit to Cambridge is complete without punting down the River Cam! It should be understood that colleges are designed primarily for students: not for children or adults expecting a high level of luxury. However, with this in mind, the colleges do meet level of comfort that we expect most visitors to be happy with, and we will welcome any feedback where this is not the case. Rooms are mainly available during the academic vacations. From London: the best options include train or bus. Trains leave every half an hour from London Kings Cross or London Liverpool St (enquiries: 08457 48 49 50; www.nationalrail.co.uk). The approximate journey time is one hour and the return fare is £15.00 to £17.70 depending on time of travel. The walk from the station to the centre of Cambridge takes about 20 minutes, or you can take a taxi from the rank at the front of the train station, the approximate cost of which is £5-£6. Parking: Cambridge is generally not very car friendly, with pedestrianised zones and one-way systems. 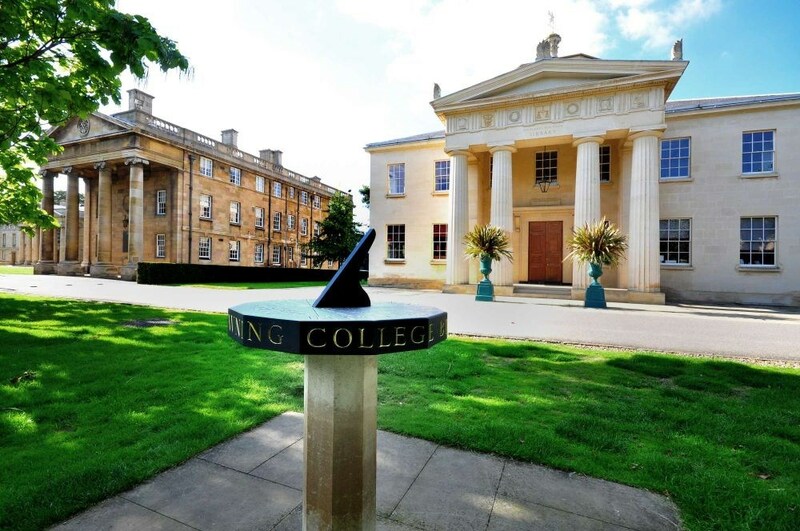 Some colleges (including Churchill, Downing, Fitzwilliam, Jesus, Lucy Cavendish, Murray Edwards) offer on-site parking facilities, or alternatively there are large car parks in the city, with more information here We would advise against using the Park and Ride services as they don't allow overnight parking. If travelling from an airport to Cambridge, the best options are either hiring a car or taking a coach: www.gobycoach.com. Whilst Cambridge possibly existed in Roman times, and grew into a Norman market town (the name of the town mutated from Grentabrige or Cantebrigge (Grantbridge) its University has made it was it is today. The University was formed in 1209 when a group of Oxford scholars moved to the town to escape the violence prevelent in Oxford at the time. But even in these days the University was having problems of discipline (!). Students belonged to no particular body, were not responsible to any person and came and went in an irregular manner. By 1231 Cambridge students were sufficient in numbers and apparently so unruly that Henry III issued a number of writs for the punishment of the disorderly. It was the solutions to these disciplinary problems, thought up by Hugh de Balsham, Bishop of Ely from 1257 to 1286 that was to sow the seeds of todays college system. He placed the scholars (now known as the "scholars of the Bishop of Ely") in two houses next to the Church of St Peter on the Trumpington Road. 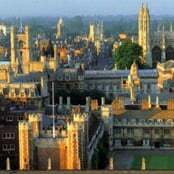 This became known as "The House of St Peter" and thus gradually the college system began to evolve, and Peterhouse, the first Cambridge college, was born. In 1318 the University was officially baptised with a Papal Bull from Pope John XXII. Other colleges followed soon after: Trinity college (originally called Michaelhouse) was founded in 1324 by the Chancellor of the Exchequer of the time, Hervey de Stanton, and Clare college, originally called University Hall, was next in 1326. Pembroke college was founded in 1347 by the wife of the Earl of Pembroke and the following year, Edward Gonville founded a college of his own which came to be known as Gonville Hall: this was then refounded by Dr John Caius in 1557 to give us Gonville and Caius. The fifteenth century also brought two other colleges: John Alcock, the then Bishop of Ely, founded Jesus in 1469 and Robert Wodelark, a Provost of Kings College, founded St Catharine's in 1473. Now with 31 colleges, the University has gradually grown in size, stature and influence on the world: its graduates have reached the highest levels in science, the Church, government, and business throughout the world.